1) Pedro Martinez is no stranger to a good old Boston rally. That's why he and his wife Carolina invite all of Boston to join them as they introduce and celebrate the runners of the first ever Pedro Martinez Charity Boston Marathon team at the Rally with 45 on Sunday, April 15, from 5pm-8pm. Rally with 45 promises to be an epic night at a new Boston hot spot, as they rally for the Pedro Martinez Foundation Boston Marathon team. Rev up for the Boston Marathon by having a great time for an amazing cause. All proceeds go to the Pedro Martinez Foundation, which holistically educates and supports underserved children and families in Latin America and the United States. Over the course of 10 years, they have reached and helped hundreds of thousands of children and families. They provide meals, clean water, education, scholarships, job training skills, day care services, hurricane relief and assistance, new home construction, sports education, and so much more. It is their belief that it "takes a village" to raise a child and support a family, therefore they truly rally around children and families, to allow them to have a brighter future today and tomorrow. WHERE: The new Hurricane's at the Garden located at 150 Canal Street - just steps from TD Garden. HOW: Tickets are $39 for general admission and $119 for VIP, and can be purchased at https://www.eventbrite.com/e/rally-with-45-tickets-44339164635. 2) Chef Daniel Bruce and Chef de Cuisine Keith Bombaugh invite guests to Meritage Restaurant + Wine Bar to celebrate the start of spring with an Early Spring Forage Dinner on Friday, April 6, from 7pm-10pm. The Chefs will present a special menu featuring the freshest early spring ingredients with expert wine pairings to toast to the end of winter. 3) On Wednesday, April 4th at 5:30 p.m., SRV’s co-executive chefs of Kevin O’Donnell and Michael Lombardi will continue their cicchetti takeover series with guest chef, Will Gilson of Puritan & Co.. Guests will be treated to Gilson's spin on cicchetti (or Italian small bites,) which will be served up complimentary in SRV’s sleek bar and bacaro area of the restaurant where guests can pair their gratis bites with Italian-inspired cocktails, amaro or a variety of wine by the glass and bottle. The complimentary cicchetti will be available until supplies last. Reservations are not required. Featured cicchetti will not be available in main dining room. 4) The Wine Press, which is located in Brookline, is one of my favorite wine shops so I was happy to learn they will be expanding to a second brink-and-mortar location in the Fenway neighborhood. The new store, Wine Press Fenway, will be located at 200 A Brookline Ave., in the Pierce Boston residential high-rise across from Regal Cinemas. It should open sometime this summer. The Wine Press Fenway will feature a modern custom-designed interior, attractive floor to ceiling wine racks, and a dedicated space for wine tastings. Not only will they sell wine, but as they do in the Brookline store, they also will be selling exciting beer and spirit selections. The Wine Press hosts free wine tastings every week and numerous other events each month to help introduce patrons to new drinking experiences. In 2017, the Wine Press offered over 800 different wines and hosted over 75 tastings. They will hold similar tastings and events at Wine Press Fenway. I'm looking forward to their new Fenway location and will report back once it opens. 5) Kane’s Donuts is bringing the flavors of spring to New England with fresh, local ingredients like blueberries from Maine and honey from Peabody. The April flavors of the month include: a Honey Blueberry Pie Donut, Snickers Donut and an Old Fashioned Glazed Donut, along with a Gluten-free Chocolate Ganache Donut and Chocolate Coconut cupcake. The Honey Blueberry Pie Donut is a light and airy yeast-style donut, filled with blueberry pie filling and dipped in the Kane’s signature honey glaze. The Snickers Donut is a yeast-style donut, frosted with Taza milk chocolate, topped with chopped Snickers and peanuts, and drizzled with a caramel swirl. The Old Fashioned Glazed Donut is an old-fashioned cake-style donut with a hint of nutmeg flavor, crispy on the outside and tender on the inside, and dipped in a honey glaze. For the gluten-free April flavor, Kane’s has crafted a Gluten-Free Chocolate Ganache Donut, a rich chocolate cake donut dipped in a decadent chocolate ganache. The cupcake of the month is a Chocolate Coconut Cupcake, a devil’s-food cake base topped with a creamy vanilla frosting, then rolled in sweetened coconut flakes. The above-mentioned flavors of the month are available at both Kane’s locations, Saugus and Boston, throughout the month of April. 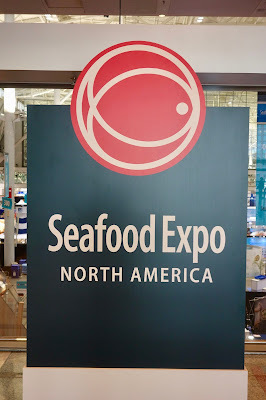 What were some of the most interesting seafood products that I found at the 2018 Seafood Expo North America (SENA)? Each year, the seafood industry presents a myriad of new products at SENA, some which end up in the New Product Showcase, hoping to win a Seafood Excellence Award. Only two such Awards are selected, the Best New Retail Product and Best New Foodservice Product. Other exhibitors simply present their new products at their booth, often providing samples intended to entice people to purchase their new item. Each year, as I wander up and down the aisles of the Expo, I seek out intriguing new products, hoping to find something fascinating and delicious. This year, I found several items which stirred my interest. The first item was the winner of the 2018 Seafood Excellence Award for "Best New Foodservices Product." Thai Union, through its Chicken of the Sea brand, has created Yellowfin Tuna Slices, essentially deli slices of tuna. What a cool idea! It is now even easier to make a tuna sandwich, simply piling on slices on your bread rather than the broken pieces you remove from a can and need mayo to keep together. Sliced tuna is also very versatile and you can check out numerous recipes here. I was curious though as to how these tuna slices were produced, and whether they contained any fillers or additives. I was pleasantly surprised to learn that these slices are essentially tuna and seasonings. They begin the process with a whole loin of yellowfin tuna, sustainable, and mostly sourced from the western Pacific Ocean. Currently, they are seeking certification through Marine Stewardship Council. The loin is placed into a plastic bag with seasonings and then undergoes a high pressurization process which will form the loin into the requisite form and texture. This process also heats and cooks the tuna, as well as forcing the seasonings to flavor the entire loin. Once completed, the tuna is then sliced into approximately one ounce pieces, currently sold in two pound, vacuum sealed packages (about $16) to commercial businesses like restaurants. The tuna slices are available in two flavors, Black Pepper and Cajun, though they have the capability to produce almost any flavor. I had the opportunity to taste both flavors and I was impressed with the tuna's texture and flavor, especially enjoying the spicy heat from the Cajun style. It tasted like tuna and I love the ease of use, how it can so simply used on a sandwich, in a wrap, atop a salad, etc. I believe these tuna slices could get more people to eat seafood, as it avoids one of the main complaints about seafood, that it is too difficult to cook. With these slices, it is as easy to use as sliced roast beef, turkey or bologna. And the fact that it is basically tuna and seasonings should appeal to people seeking healthier alternatives. Plus, it provides the benefits of Omega-3s, which can significantly reduce the chance of heart diseases. Maybe we can look forward to other sliced fish in the future. The deli counter has taken a step toward the future. The next item is related to tuna, though it actually doesn't contain any tuna at all. Ocean Hugger Foods, Inc. was founded by Master Chef James Corwell, a native of Atlanta. Chef Corwell was concerned about the state of bluefin tuna, understanding the precarious status of the species. He decided to create an alternative to tuna, something which would help protect and conserve the oceans. His first creation is Ahimi, a plant-based alternative to raw tuna, which can be used in sushi, ceviche, tartare and more. Ahimi is made from five ingredients, including fresh tomatoes, soy sauce, filtered water, sugar, and sesame oil. For those with allergies, please note that Ahimi contains soy, wheat, gluten, and sesame. You should use Ahimi whenever you might use raw fish, and they highly recommend that you do not cook the Ahimi. It last be stored frozen for up to two years, and will last, once opened, for about four weeks in the refrigerator. 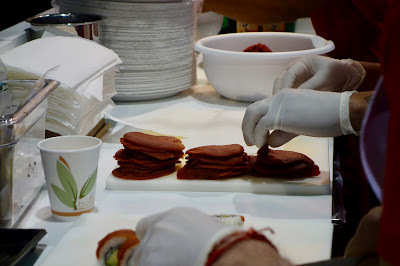 At the Expo, they were preparing Ahimi Nigiri, which involves slicing strips from a large piece of the Ahimi, placing the strip atop a piece of rice, and then wrapping nori around both. At a quick look, they resemble tuna nigiri but if you look closer, the color won't seem to be the same. When I bit into a piece of the Ahimi, it had a tougher texture than tuna, not the silky fish you might be used to. Eating a piece of the Ahimi and rice, you likely won't believe it is tuna either. However, it still possesses a pleasant taste and would please someone seeking a vegetarian alternative to tuna. If you love tuna, the Ahimi isn't going to replace that taste, but it is definitely a way to help preserve the endangered bluefin. I might like the Ahimi even more if it were in a ceviche or poke. Ocean Hugger Foods is working on additional products, including Sakimi, a carrot-based salmon alternative, and Unami, an eggplant-based eel alternative. More vegetarian options were offered by Barnacle Coast to Kitchen, an Alaskan company that uses seaweed to create a variety of products. The founders, Matt Kern and Lia Heifetz, are natives of Southeast Alaska and would fish and forage bull kelp, preserving the seaweed by pickling it and making salsa. Eventually, they decided to make a business out of their activities, remaining in their local community and using the sustainable kelp, which they harvest from the Alaskan wasters. Their website describes the kelp, stating: "It’s snappy, salty and savory, with a crisp bite. Bull kelp grows annually, from spore to mature plant in a single year. As it grows, it attaches to the ocean floor via a “holdfast”—a root-like growth that clings to rocks or other anchorages. From there, the stalk can grow up to 80 feet, with a floating bulb at the surface. Bull kelp forests create vital habitat for fish, sea urchins and starfish. Sea otters often wrap kelp strands around their bodies to secure them during rough weather." Check out the Seafood Source for a recent article on the rise in popularity of seaweed. At prior Seafood Expos, I've tasted a few different products made from seaweed and have enjoyed them, so I was intrigued to check out Barnacle's products. Unfortunately, only the Campfire Kelp Salsa seemed to be available to taste. There are three varieties of their Kelp Salsa, the Original, Campfire, and Sea Verde. The addition of the Kelp is supposed to boost the flavor and richness of the salsa, as well as add a nutritious and sustainable ingredient. A 10 ounce jar costs approximately $7.95 and each salsa contains about 50% Kelp. Their Campfire Kelp Salsa won the Juneau People's Choice award of the Alaska Symphony of Seafood. Its ingredients include Alaskan Kelp, tomatoes, onion, lemon juice, vinegar, garlic, beets, tomato paste, cilantro, honey, and spices. I was impressed with the Campfire, finding it to be delicious, spicy and smoky, with rich tomato and prominent garlic flavors. It was savory, with an intriguing umami element, and you wouldn't have known it contained kelp unless someone told you. It was excellent atop a tortilla chip and I could easily see it used in anyway you might use a regular salsa. And it is more nutritious than many other jarred salsas. This earns my hearty recommendation. Barnacle's other products include Kelp Pickles and Kelp Blends. The Kelp Pickles, available in Dill and Curry, are thinly sliced, seasoned bull kelp rings, which can be used on sandwiches, as a cocktail garnish, or simply on their own. The Kelp Blends, available in Galley Mix and Ocean Gold, consist of dried kelp that is blended with ingredients such as toasted sesame seeds, bonito flakes and nutritional yeast. They can be used to flavor almost any type of dish. 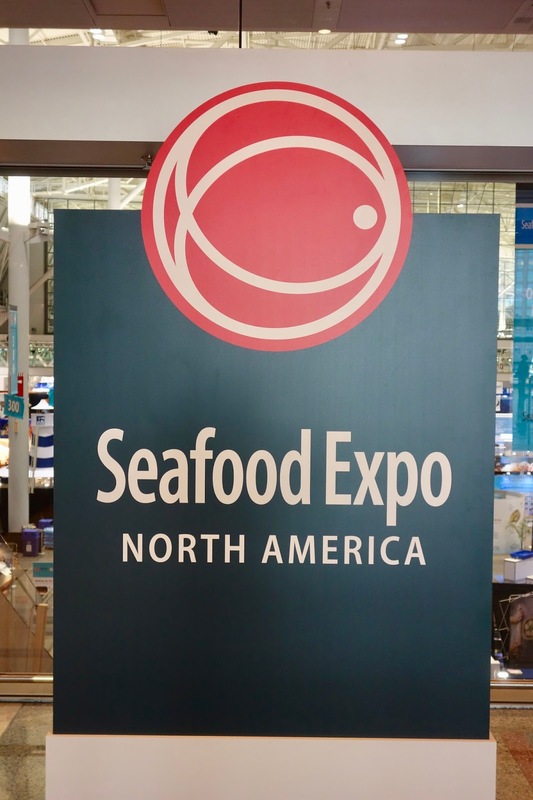 I'm certainly thankful for all the seafood I tasted at the recent 2018 Seafood Expo North America (SENA). This was a tough year for SENA as a major snowstorm struck on their third day, significantly decreasing the number of attendees on that day as well as stranding some exhibitors and attendees in Boston for an extra day or two. In addition, I was unable to attend the first day of SENA, due to another commitment, so I only got to attend the Expo for one day. During that day, I immersed myself within the seafood industry, enjoying plenty of seafood samples and seeking out interesting stories. 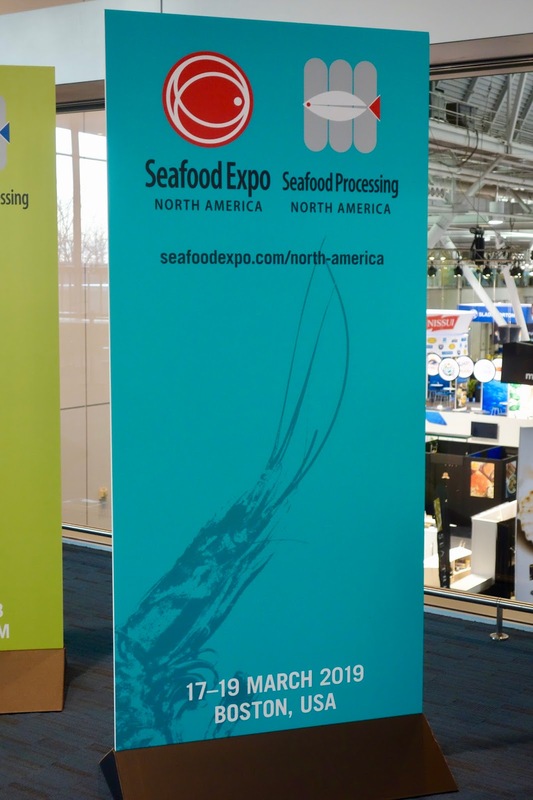 SENA is the largest seafood trade event in North America, continuing to grow each year, constantly breaking records on its size and attendance. Last year, over 1327 companies, representing 51 different countries, exhibited at the Expo and this year, that number rose to 1341 exhibitors, from 57 countries, including new ones such as Fiji, Oman, Ukraine and Venezuela. The total exhibit space grew from approximately 253,000 square feet to about 258,630 square feet. Walking down the 30+ aisles of the Expo makes for great cardio exercise and with the vast number of exhibitors, you're sure to find plenty of fascinating stories. 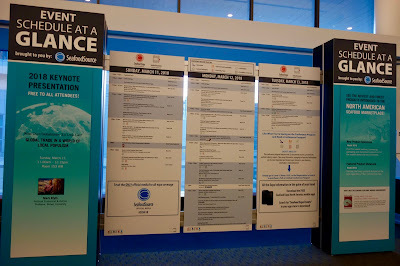 The basic Expo events occur each year from Sunday to Tuesday, over the course of 19 hours. This year, the program included over 30 conferences sessions, the 12th annual Oyster Shucking Competition, a Master Class on Oysters, a Maine Lobster cooking demo, and more. Something for everyone. You certainly can't attend every SENA event, so you need to pick and choose which you most desire to attend. This year, there were also over 20,000 attendees, from all over the world, making the Expo a truly international event. SENA is my favorite food event each year, one which I have promoted and recommended year after year. Besides all the seafood samples, you'll also find ample fodder for many different story ideas. As an example, I've previously written as many as 22 articles based on stories I acquired from a single Seafood Expo. SENA touches on some of the most important issues facing our world. Every local writer who has any interest in seafood, sustainability, health, or food in general, should attend this Expo. However, it seems few local writers actually go to SENA and those who do commonly write only a single article or two about it. These articles are often very basic, touching only on some of the most general issues about the Expo. Even the major local newspapers generally publish only one article, often a basic overview lacking any depth. That needs to change! We need more local writers to attend SENA and delve more deeply into the myriad issues of the seafood industry. We need more local writers to help promote seafood consumption and sustainability. We need more local writers to contribute to the discussion of these vital issues. It is obvious that a primary element of SENA is commerce, the buying and selling of seafood-related products and services. Nearly all of the exhibitors are there to make money while most of the attendees are there to spend money. Attendees are seeking seafood, both fresh and frozen, as well as various processed seafood products, from crab cakes to salmon bacon. Others are there to buy processing equipment, cooking supplies, packaging machinery, labeling equipment, conveyors, and much more. Still others are seeking services, from food safety to third party certification. Some of this commerce is international, with exhibitors and attendees from all over the world, trying to make deals. What may not seem obvious is that SENA is not really about seafood. It's not??? Despite the many thousand pounds of seafood being showcased at the Expo, it is all merely a means to an end. SENA is actually about people and community. Seafood is only food, intended to provide sustenance and nutrition to people, and that is understood, though largely unspoken, by the exhibitors and attendees. SENA is much more about fishermen and fish farmers, distributors and retailers, inventors and importers. It is about all of the people involved in the seafood industry, and their economic well being. It is about the global economy as the seafood industry is truly international and affects people all across the world. Concerns about seafood sustainability ultimately come down to the fate of people, whether future generations will have enough food to survive, and whether they will live in a clean world, with adequate resources. The fate of the oceans and the fish directly relates to the fate of mankind. When you understand that SENA is all about people, then the issues take on an even greater significance. We need to talk about this more, to ensure that everyone understands people are the primary concern. It is our future and nothing is more important than that. Although SENA involves many serious and vital issues, it also has an element of fun, as well as plenty of tasty seafood samples. SENA is a showcase for new seafood products as well as place to display other seafood products which may have a storied history, such as Maine Lobster. Though it is common to find for sampling a variety of simple, fried seafoods, there are also some chefs who elevate their offerings, providing more interesting and delicious dishes, from Monkfish Stew to Salmon Meatballs. Over the course of a day at SENA, you can enjoy plenty of seafood, from oysters to uni, and you can repeat that for three days if you so desire. I'll be posting additional articles about SENA in the near future, highlighting some of items which especially caught my attention this year. Plus, I want to highlight that SENA returns next year, March 17-19, 2019, and I strongly encourage all local writers to mark those dates down on their calendar and plan to attend next year. As I've mentioned before in other articles, there are about 4 times as many negative seafood articles in the media than positive ones. The seafood industry needs more champions to promote its many positive aspects and I call on local writers to step up and become one of those needed champions. Next Sunday is Easter, a holiday which partially showcases the Easter Bunny, who supposedly delivers baskets of candy and treats to children. When I think of rabbit, I think of its delicious and nutritious meat, which can be prepared in so many different ways. That thought makes some people squirm, those opposed to the idea of dining on a rabbit. Why are so many people opposed to eating rabbit, despite the fact it is so tasty, sustainable, and a healthy option? Some people may have had a cute, fuzzy bunny as a pet, keeping it in a small hutch, and thus feel squeamish about eating something they once had as a dear pet. These feelings are relative modern and that sentiment wasn't an issue for many prior generations. We need to return to those earlier sentiments as the consumption of rabbit is good on several fronts, as it is the most nutritious and sustainable meats that exists. Around 1100 B.C., when the Phoenicians first came to Spain, they found rabbits there and it is probable that they then spread rabbits throughout the Mediterranean region. The ancient Romans enjoyed rabbit meat, and they even created leporaria, walled areas where they raised rabbits for later slaughter. There once was even a Roman law that all young women had to eat rabbit because it was thought it would make them more beautiful. Rabbits have continued to be eaten as food throughout history, though consumption in the U.S. has apparently declined greatly at least over the last hundred years. Have you ever noticed that it seems almost every movie about the Middle Ages shows rabbit being eaten? Nowdays, Europeans are far more amenable to dining on rabbit and France is the largest producer and consumer of rabbit. My first time eating rabbit was when I was in Spain over 15 years ago. Why should we eat more rabbit? First, it is an excellent sustainable choice, far more sustainable than beef, pork, lamb or poultry. Rabbits eat grass and marginal forage, thus they do not compete for resources with people and are more easily fed than many other animals. They will even eat food scraps, which would be a great use for all of our vast food waste. We all know how rapidly rabbits can reproduce and they are available year round. Rabbits require little space, certainly much less than other food animals. You could even raise rabbits at home, which is relatively easy to do. It is said that a rabbit can produce six pounds of meat for the same amount of resources which a cow needs to produce a single pound. The carbon footprint of raising rabbits is far lower than other common food animals, and thus much better for the environment. As the demand for meat continues to increase, it may be impossible to meet that demand without causing significant environmental problems due to increased resource intensity. Beef may be the largest offender, requiring significant resources which could be instead used for other purposes which might better feed more people. The increased consumption of rabbit could alleviate these issues, as rabbits require far lesser resources. It is something that needs to be seriously considered. Second, rabbit meat is very healthy and nutritious. The U.S. Department of Agriculture has even stated that rabbit is the most nutritious meat. Rabbit has only 795 calories per pound, compared to chicken at 810, turkey at 1190, beef at 1440 and pork at 2050. Rabbit also has the highest percentage of protein of any meat. In addition, rabbit has a lower percentage of fat and less cholesterol than chicken, turkey, beef, or pork. Rabbit is easily digested, and has very high levels of Omega-3's and other good fats. Those are all good reasons to opt for rabbit. Third, and a very important reason, rabbit tastes good. It has a mild and slightly sweet flavor, in some respects like chicken, though it can also remind you of veal or even pork. You won't find it to have a gamey flavor, which can be offputting to some. Plus, nearly all of the rabbit is white meat, which appeals to many people. It is generally lean meat, so be careful about overcooking it. In addition, different parts of the rabbit have different characteristics so you can get a variety of flavors within the rabbit. If you tasted rabbit blind, you would very likely enjoy the meat though you probably would not realize it was rabbit. The main resistance to eating rabbit appears to be primarily psychological. It is seen more as too cute to eat, too much like a pet. Yet those who actually eat rabbit find out how delicious it can be. Plus, as it is so sustainable and nutritious, more people should be eating rabbit. Break through that psychological barrier and try some tasty rabbit. It is good for you, good for society, and good for the environment. While you're eating some rabbit, you might even want to consider drinking some. 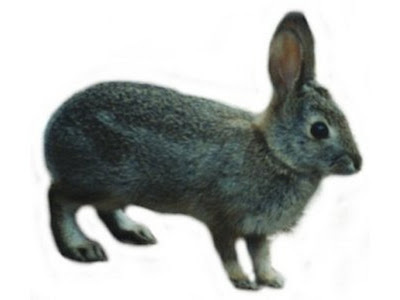 Check out the compelling Pierde Almas Mezcal de Conejo, a pechuga which is produced with the addition of a saddle of a wild, Cottontail rabbit. It is a complex, delicious and intriguing Mezcal, one I highly recommend. Eat & Drink The Bunny! 1) Guests are invited to continue the St. Patrick’s Day celebrations with Glendalough Distillery, Ireland’s first craft distillery, on Wednesday, March 28, at 6:30pm, at Formaggio Kitchen in Cambridge. While wine often takes the spotlight, whiskey and cheese make excellent partners, and you'd be hard-pressed to find stronger advocates for that fact than the team behind this class. Guests are welcomed to join Dan Pontius, Bar Manager of Alden and Harlow and Donal O'Gallachoir, a representative for Glendalough Distillery, along with Julia Hallman, cheesemonger and general manager at Formaggio Kitchen Cambridge, for a spectacular evening of whiskey and cheese. During this edible lesson on how and why whiskey and cheese pair so well together, Donal will explain the origin and rich history of Glendalough Distillery as well as the vast and distinct flavors associated with the various types. Next, Julia will discuss a variety of cheeses, how they are made and what characteristics make them a perfect complement for whiskey. Together, they'll plate up some of our favorite cheeses alongside a variety of whiskey styles in a multi-flight tasting to illustrate the toothsome and tasty potential of this kind of pairing. Lastly, not to be outdone, Dan will whip up a couple whiskey cocktails highlighting Glendalough Distillery which will be perfectly paired with cheese. Founded by five friends from Wicklow and Dublin with a deep passion for reviving the heritage of craft distilling in Ireland, Glendalough Distillery has forged their own path to produce innovative spirits while staying true to the tradition and legacy of their Irish ancestors. Glendalough (meaning The Valley of Two Lakes) is a glacial valley nestled in the Wicklow Mountains renowned for its early medieval monastic settlement founded in the 6th century by St. Kevin, a legendary monk and the man depicted on their bottle. The Double Barrel Irish Whiskey gains its sweet, smooth vanilla notes from three years in bourbon barrels before being transferred to 500 litre Oloroso casks from Montilla, for up to a year, where it becomes steeped in rich, dark, fruity and floral flavors (raisins, sultanas, fig, candied peel, cinnamon and nutmeg) with a nutty, complex finish. The 7 Year Old Single Malt gets its flavor from Dublin’s Black Pitts Porter craft beer barrels, the deep, dark flavors of chocolate malt and roasted barley give the whiskey its cocoa, toffee and dark-chocolate-orange notes. The 13 Year Old Single Malt is the first and only Irish whiskey that uses Japanese Mizunara oak. Extremely rare and expensive, the oak is found in the forests of Hokkaido; its high levels of vanillins pack a punch, with exquisite sandalwood flavors, layered with honey, and citrusy notes for a distinctly unique tasting whiskey. Tickets cost $65 and you can purchase them through Eventbrite. 2) Executive Chef Nick Deutmeyer and the team at Post 390 are calling all cheese lovers for a special Massachusetts Cheese Trail Farm to Post menu, featuring a special kick off dinner showcasing the top Massachusetts cheese farmers. Post 390 welcomes guest for a Farm to Post dinner on Wednesday, April 4, from 6pm-9pm, with the spotlight on Massachusetts artisan cheese farmers. Executive Chef Nick Deutmeyer takes guests on a journey through each course, highlighting specific notes of each decadent cheese and their perfect flavor pairings. Chef Nick has crafted a special Farm to Post menu to showcase these exquisite cheeses from award-winning local farms such as Upinngil Farm, Ruggles Hill Creamery, and Westfield Farm. Guests can mix and mingle with representatives from each farm, who will be onsite to share some details about their unique cheeses. The event kicks off at 6:00 p.m. and begins with a welcome reception followed by a seated four-course dinner. Arpeggio "the aroma and flavor notes of the terroir in one bite"
Greta's Fair Haven "fruity, peppery, and densely textured"
Hubbardston Blue Cow "surface ripened...very soft and creamy center"
Extra Aged Gouda "creamy, nutty parm-like cheese"
Hannahbells "thimble-shaped morsels that pack a dramatic throw-weight of pungency and lingering flavor"
Tickets are $55 per person and include tax, gratuity, and beverage pairings. They can be purchased through Eventbrite. Reservations are required. 3) On Wednesday, March 28, from 7 to 10 pm, Joe's American Bar & Grill at 181 Newbury Street is hosting their second annual Down East Cider dinner. Guests will be able to enjoy a special menu prepared by new Executive Chef Scott Gagne featuring 5 courses of culinary treats paired with a different cider variation from the cider brewery for just $50 (excludes tax and gratuity). Tickets are limited and can be purchased via the Joe's Down East Cider Dinner Eventbrite page. 4) Chef Chris Coombs and the Boston Chops staff invite guests to join them for a special four course Bourdeaux-inspired wine dinner on Monday, April 2nd, at 7 p.m. The evening will feature wine from France's wine capital, paired with a delectable Spring menu crafted by Chef Chris Coombs. Tickets are $79 plus tax and gratuity, and can be reserved by calling (617) 227-5011. Dead Guy Ale to Rogue Sriracha Hot Stour, Yellow Snow Pilsner to Hazelutely Choctabulous, 8 Hope IPA to Morimoto Soba Ale. You might be familiar with these and other beers produced by the Rogue Brewery in Oregon. For over 30 years, this brewery has been at the forefront of the craft brewing movement. However, you might not know that they also own a distillery, producing primarily Whiskey and Gin, and these spirits are definitely worthy of your attention. Initially, the Rogue team obtained the first distilling license in Washington, with plans to make Rum, but that lasted only a few days. 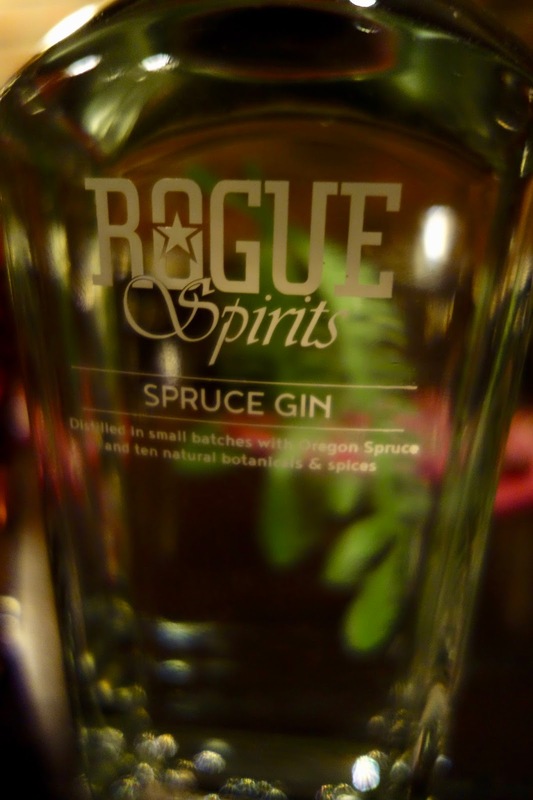 Unfortunately, the distillery was shut down by the fire department so Rogue moved the facility to Oregon, which opened in 2003. Rogue Ale & Spirits became the first rum distillery in Oregon since the repeal of Prohibition. Their first spirits were Vodkas and Rums (such as Dark Rum and Hazelnut Spiced Rum), though those are now being phased out so the distillery can concentrate on producing quality Whiskey and Gin. Recently, I met up with Dewey Weddington, the Director of Spirits at Rogue Ale & Spirits, and he tasted me through several of Rogue's new spirits. We met at Saloon, in Davis Square, sampling these spirits while accompanied with food. I've known Dewey for over six years, and respect his knowledge of wine, Sake, spirits and Oregon. 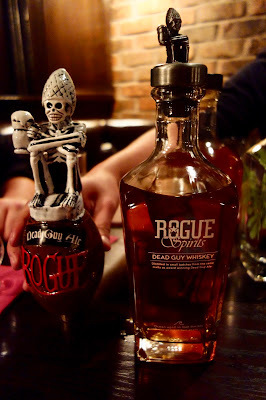 It was a pleasure to raise a glass with him again, as well as learn about Rogue's intriguing spirits. 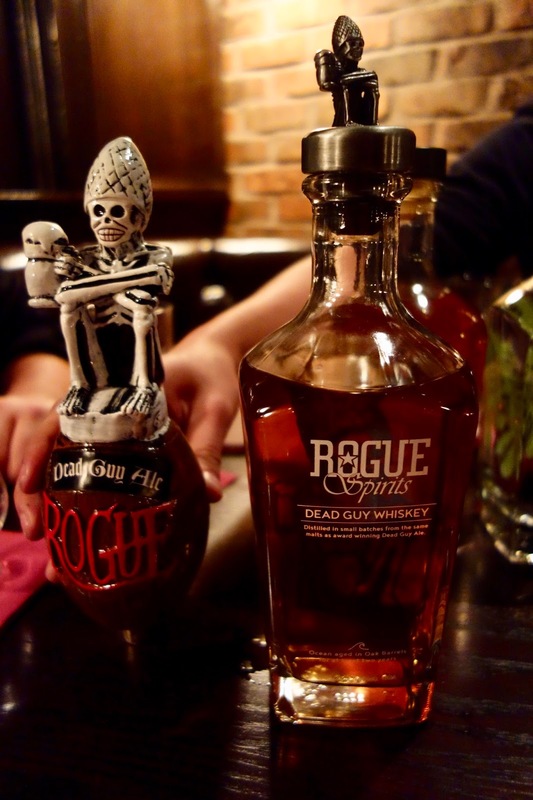 Rogue is creating artisan spirits, often using local ingredients, and aren't afraid to be innovative. They are also more unique as they are the only brewery in the U.S., and one of the very few distilleries, that owns their own cooperage. With the importance of barrel aging for whiskey, then owning their own cooperage is a significant advantage. Currently, they are using American oak for their barrels though they have started experimenting with some Oregon Oak, which they've found to possess less vanilla flavor and more citrus and baking spice. Next year, they are likely to release their first spirit that was aged in Oregon Oak, so that is certainly a fascinating item for the future. Rogue's concentration will be on three different Whiskies and two Gins, and I tasted four of the five as their Rye Whiskey was not yet available. As you'll see from the photos below, the bottles are relatively simple in design, and I like that simplicity as it presents a more serious note. They aren't trying to cover up anything with a splashy design and amusing name. Instead, they want the exterior to be more understated, and let the liquid make the bolder statement. 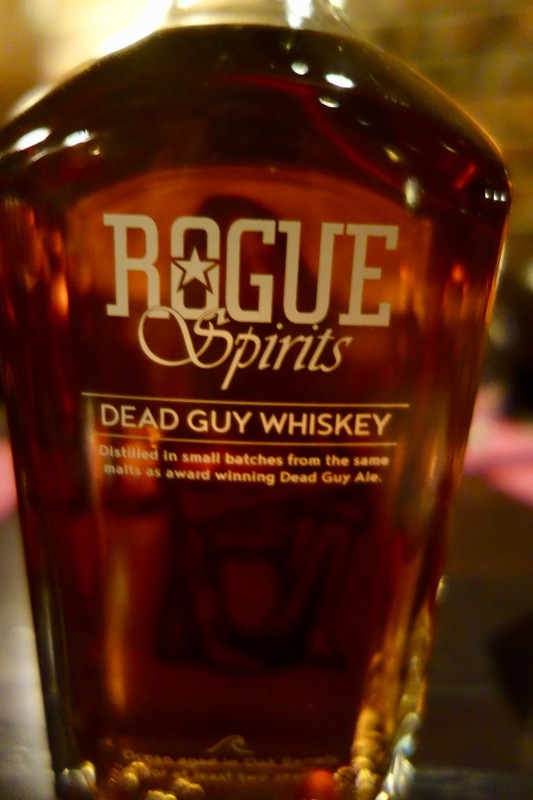 The Rogue Spirits Dead Guy Whiskey ($49) uses the same base as their Dead Guy Ale, the same four malts just without any hops. The four malts include 2-Row, Maier Munich, C15 & Rogue Farms Dare™ and Risk™ Malts, while the other two ingredients are Pacman Yeast & Free Range Coastal Water. This whiskey is aged for 1-3 years, in Charred 3 American oak, and is said to be "ocean aged." What that means is that the distillery is located close to the Pacific Ocean and Yaquina Bay, and that the aging room is open to the outside, open to the elements. In this region, aging is considered to be slow and steady as there are few high temperatures and a high humidity from the ocean. Bottled at 40% ABV, the whiskey has a pleasant aroma, with hints of orange and vanilla. On the palate, there is an interesting blend of flavors, with notes of citrus, caramel, maltiness, and hints of salinity. There is also a subtle taste reminiscent of beer which permeates the whiskey. It would be good on its own, or could be used in a variety of cocktails. 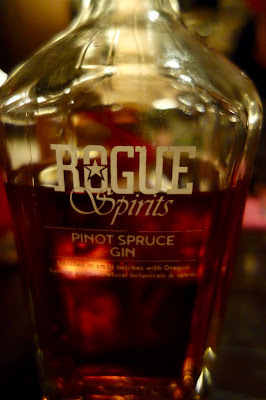 My favorite spirit of the evening was the Rogue Spirits Oregon Single Malt Whiskey ($65), which was only released a couple months ago and isn't yet available in Boston though will be in the near future. It is made from only three ingredients, including the Rogue Farms Risk™ Malt, Free-Range Coastal Water & Pacman Yeast, and was aged for about five years in American oak. Their website states: "The grains used are plowed, disced, harrowed, seeded, fed, watered, threshed, winnowed, malted, milled, mashed, fermented, distilled, smithed, barrel-aged and bottled by hand. When you grow it, you know it." This light-colored whiskey possesses an alluring aroma, a complex blend of intriguing scents, which will make you simply sit and sniff your glass for a time, enjoying the aroma alone. On the palate, the complexity remains, with such a fascinating melange of flavors, caramel to vanilla, baking spice to stonefruit, citrus to chocolate. Silky smooth, well-balanced and with a lengthy & satisfying finish. Absolutely delicious and it will please any whiskey lover. Dewey stated he felt it reminded him of a Speyside whisky. 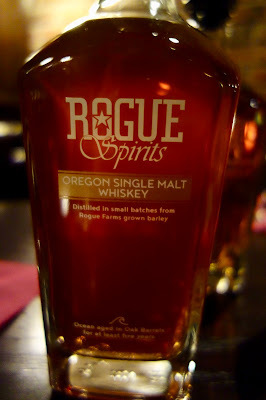 The Rogue Spirits Oregon Rye Whiskey has not yet been released. They used to have a rye farm in Independence, Oregon, but there were significant problems with slugs so they decided to move the farm, eventually selecting Tygh Valley. They are hopeful this new area will prove more beneficial for their rye. As a lover of Rye Whiskey, and based on the high quality of their Single Malt, I'm anxious to taste the Rye once it is released. While sipping these spirits, we enjoyed some of Saloon's tasty cuisine. The Single Malt paired exquisitely with the briny Oysters, and more restaurants need to embrace the pairing of Whiskey & Oysters. The Devils On Horseback, feta-stuffed dates wrapped in bacon, are a decadent treat and also went well with the whiskey. The Poutine, potato wedges with garlic cheese curds & bacon gravy, was also a tasty comfort food, a fine bar snack. Though you might like drinking Whiskey on its own, it can pair well with a variety of dishes, an idea that isn't promoted enough. I'm very particular as to the Gins I like, preferring a gin which has a more balanced taste of botanicals rather than one that is all about the juniper. The Rogue Spirits Spruce Gin ($35-$40) fits into my preferences, presenting a delicious, intriguing and balanced mix of botanicals from Oregon. The ingredient lists includes Spruce, Juniper Berries, Ginger, Fresh Cucumber, Orris Root, Orange Peel, Lemon Peel, Tangerine, Grains of Paradise, Angelica Root, Coriander & Free Range Coastal Water. It was fascinating to learn that around August, when the thousands of cucumbers are harvested, they are then peeled, one-by-one, a lengthy and laborious process. Approximately 100 pounds of cucumbers have to be added to each batch. The fall is also the only time of the year that they produce this gin. On the nose, there is an intense smell of juniper, but beneath the dominant juniper were more subtle notes of the other botanicals, such as the spruce and citrus. On the palate, the botanicals balance out into a delicious and interesting combination, from fresh cucumber to herbal spruce, bright citrus and hints of spice. This could easily be drank on its own, with a little tonic, or make for an excellent component in a cocktail. This is certainly a Gin I would recommend. The Rogue Spirits Pinot Spruce Gin ($35-$40) is the same gin as above, except this gin has been aged for about six months in former Pinot Noir barrels, mostly obtained from Chehalem Winery. As expected, the gin has a pleasing pink color from the barrels. In addition, the flavor profile adds an element of red berries to the botanicals, as well as some subtle notes of vanilla and baking spice. It is a more unique gin variation and works quite well. It is almost as if you created a Gin cocktail with Pinot Noir, though this would work well in other cocktails. Even gin haters may have an interest in this gin. Within time, Rogue will be known for far more than just their craft beers, forging a name for themselves in the spirit world as well. Their Single Malt is compelling and should impress any whiskey lover. Their Gins are also compelling, worthy of your attention. Some might feel these spirits are too expensive however you should understand what you are purchasing. These are spirits made from local ingredients, created by a small, artisan distillery, and they are quality products. You should also ask yourself, do you want to support small, U.S. craft distilleries? I believe these spirts are worth the price and highly recommend them. Rant: Would You Fish For Dinner...At A Restaurant? Imagine this: You enter a local seafood restaurant and are handed a fishing pole, to use to catch the fish that you'll eat for dinner. Does that appeal to you? Would it be fun? Or would it be far too much work? And what happens if you catch the wrong fish? Zaou is a chain of restaurants in Japan where you can fish for your dinner and one is going to open in the Chelsea neighborhood of New York City. When you dine at the restaurant, you have the option to fish or not for your dinner. If you want to go fishing, they'll rent you a rod and provide you with bait. If you need assistance, they will help you catch your intended fish. However, if you catch the wrong fish you might still have to pay for it. Once the fish is caught, it is then delivered to the kitchen, which will prepare it in a variety of ways dependent on your choice. Grilled, Tempura, Sushi and more. There is a financial benefit to catching your own fish too as Zaou charges you less if you catch your own, maybe about $8-$10 less. However, you have to consider the time involved that you might spend fishing, dependent on how successful you can be in a short time period. If you're a poor fishermen, you might be waiting for your dinner, which could be a problem if you are in a group and the others are better, quicker fishermen. I can see this as being a novelty for a time or two, but I certainly wouldn't want to make it a regular occurrence. You most often go to a restaurant to relax, not to spend your time working for your dinner. I know people that dislike going to a Hot Pot or Fondue restaurant as they dislike having to cook their own meal. I can't see them wanting to fish for their dinner either. I see it more as a tourist attraction, the novelty of fishing inside a restaurant, rather than a neighborhood spot where everyone goes to eat. As I want to motivate more people to eat seafood, then I see Zaou as a good thing, something which could attract more people to seafood. However, I'm also very glad that you don't have to fish at Zaou to enjoy their seafood. Would you like to see Zaou, or a similar restaurant, in Boston? 1) Adelita, located in Concord, serves organic Mexican cuisine and is now open for both lunch and dinner. From the team behind Woods Hill Table, Adelita is the culmination of operating owner Kristin Canty’s passions for food, family farms and sustainable sourcing. The menu – developed and overseen by Woods Hill Table’s Executive Chef Charlie Foster – showcases Foster’s love and appreciation for the cuisine of his wife’s native Mexico. The name of the restaurant, Adelita, was inspired by the name given to the female soldiers who fought in the Mexican Revolution. Adelita also represents Canty’s fight and advocacy work on behalf of small-scale farmers and the food sovereignty movement. “Living and working in Concord, Charlie and I noticed a lack of heartfelt, quality Mexican food in the area,” says Canty. “By continuing our tradition of sourcing from my Bath, New Hampshire, farm – The Farm at Woods Hill – and taking inspiration from Charlie’s regular trips to Mexico, we can offer guests flavorful, nutrient dense Mexican food that we’d be proud to serve our own families." Composed of Chef Foster’s take on Mexican street food, the Adelita menu celebrates high quality ingredients, careful sourcing and scratch-made dishes such as tacos, ceviche and composed plates. Sourcing primarily from The Farm at Woods Hill, Foster uses grass-fed proteins throughout the menu, with dishes such as Housemade Pork Chorizo & Carnitas, Lamb Barbacoa, and Chicken Tinga. Canty and Foster also look to other small-scale purveyors for fresh ground masa, seafood, and organic (a mix of practicing and USDA-certified) produce to create flavorful, close-to-authentic Mexican dishes that are as ecologically viable as they are delicious. Adelita’s bar program emphasizes quality ingredients and carefully selected products. The star of the drink program, the Adelita Margarita is made entirely from small batch reposado tequila, housemade triple sec, fresh organic lime juice and organic aqave syrup. Unique iterations of this Mexican staple include beet and guava. Additional cocktails range from the refreshing Paloma to the smoky Mezcal Old Fashioned. Whether USDA certified or “practicing,” all wines featured at Adelita are organic, focusing on Spanish varietals. Adelita’s wine menu of minimally processed labels highlights Tempranillo and Viura’s diverse food-pairing abilities. I'm looking forward to checking out this restaurant, and enjoying a fine Mezcal with dinner. 2) On Sunday, March 18th, at 6pm, Brassica Kitchen + Cafe will host a Sunday "Pop Up." Brassica's Chef de Cuisine Matt Hummel will partner with Chef Yesid Areiza of Shepard, and cocktail virtuoso Moe Isaza of Pammy's for a dining experience inspired by the flavors of Colombia and Peru they’re calling, "Cajita Para Llevar". A colloquial phrase heard in many Latin American restaurants,'Cajita Para Llevar” means "for here or to go "— a sentimental shoutout to both the Colombian roots of Areiza and Isaza as well as the gastronomic diversity and bounty of South American countries like Colombia and neighboring Peru. The menu is highly personal, including the arepas Areiza used to make with his Mom, or Hummel's take on Pollo a Parrilla, that he discovered in a tiny restaurant in Cuzco. Bacardi Legacy Finalist Moe Isaza will craft signature libations and curate pairings that riff on classic South American flavors and popular spirits, similar to the rum and mezcal-heavy beverages he crafts at Pammy's. Tickets for this 5-course meal begin at $65 with an optional $30 beverage pairing and are available via Eventbrite. 3) Sumiao Hunan Kitchen is pulling the (bar) curtain back on a secret cocktail program that will make it’s downlow debut, this month. Designed by Bar Manager, Vinicius Stein, the 25 drink repertoire can be accessed via invite only or by spilling the secret yourself at the bar. The program, which Stein has dubbed, “Walk Up The Wall of China,” is a multi-part challenge to cocktail enthusiasts beginning with a shot of Baijiu, the best selling spirit in the world yet uncommon among the Boston beverage scene. The ancient Asian spirit is a staple in Stein’s cocktail program alongside a carefully curated selection of spirits, taste profiles and other unique accoutrements. Following the Baijiu initiation, guests will be invited to ring a Chinese bell at which point they will receive a personalized membership card to the program. Once initiated, guests will have the opportunity to extend invitations to fellow cocktail enthusiasts and challenge them to walk the wall and discover over two dozen off-menu, Asian and Hunanese influenced cocktail creations. One of Sumiao’s standout secret cocktails includes The Emperor ($14), created with muddled fresh ginger and lime, Peloton de la Muerte Mezcal, Don Julio tequila, Crème Yvette, hibiscus liqueur, agave nectar and lime reduction that is delicately garnished with a mint leaf. Available exclusively during the month of March, the beverage team has also created a $5.00 Hong Kong Mule ginger cocktail, inspired by Sumiao Hunan’s Kitchen’s dedicated support of Joslin Diabetes Center’s Asian American Diabetes Initiative (AADI). The Hong-Kong Mule further spotlights the beverage team’s celebration of Baijiu as an unsung hero in the cocktail world. A recreation of a Moscow mule, SHK’s Hong-Kong Mule marries HKB Hong-Kong baijiu and hibiscus liqueur that is topped off with ginger beer and a splash of fresh lime, garnished with fresh mint springs and a lime wedge. 4) Best Burger Bar brings Wild Game fare to Brookline. For the months of March and April, Best Burger Bar will be offering an array of wild game burgers. These burgers will be available in limited quantities, and once sold out they will move onto the next wild game special. First up is the Wild Boar Burger, a Wild Boar Patty with Honey Crispy Apple Bacon Jam and Umami Aioli all on a Brioche bun. The Wild Boar meat tastes like a cross between pork and beef, with a unique rich and nutty flavor that adds to the depth of flavor in this burger. If you’re really feeling adventurous, Best Burger Bar is also offering the option to add dried scorpions to your burger! Other assorted bugs will be available as new wild game specials are released. Best Burger Bar will also be offering three new cocktails in honor of the warmer weather that is upon us. These limited-edition cocktails will be available for the month of March only. The Concord Grape Fizz features Brockmans Gin, Pear Syrup, Lemon Juice, Egg White, and a Champagne Floater. The Violet Blue Margarita, a mix of Tequila, Lime Juice, Orange Curacao, Sesame Syrup, and Blue Curacao will be available by the glass, or in a fish bowl for sharing. The Violet Blue Fish Bowl will be available through the end of summer, the perfect beverage to share with friends on Best Burger Bar’s patio. Wild game burgers are available from March 6 to April 30, 2018. Cocktail specials are available for the month of March with an exception to the Fish Bowl which is available through Summer. 5) Sumiao Hunan Kitchen is gearing up for a one-time Sunday brunch event dubbed “A Pinch of Ginger.” The event will take place on March 25, from 11:30am-2pm, and will unite the Boston-area foodie and medical communities while supporting Joslin Diabetes Center’s Asian American Diabetes Initiative (AADI). Sumiao Chen – the restaurateur behind Sumiao, the city’s first Hunanese restaurant – is a pharmaceutical researcher at Novartis by-day whose passion for food and science inspired her to get involved with Joslin’s signature spring fundraising event, “A Taste of Ginger.” This brunch will serve as a preview to “A Taste of Ginger” happening in April at the Museum of Fine Arts which will feature cuisine from more than 30 restaurants. 6) On Monday, April 9, from 6:30pm-9:30pm, Joslin Diabetes Center’s will host the 14th annual “A Taste of Ginger” at the Museum of Fine Arts to benefit Joslin’s Asian American Diabetes Initiative (AADI) which works to enhance the quality of life and health outcomes for the rising number of Asian Americans living with diabetes, and collaborates with Joslin as they work to find a cure. Each year, hundreds of supporters and foodies gather to enjoy a lively evening full of cultural and musical performances and the opportunity to meet and taste the cuisine of more than 30 of Boston’s chefs such as Jasper White, Joanne Chang of Flour Bakery + Café, Andy Husbands of the Smoke Shop, Tracy Chang of Pagu, Karen Akunowicz of Myers + Chang, Sumiao Chen of Sumiao Hunan Kitchen and Avi Shemtov of the Chubby Chickpea, amidst the beauty of the MFA. Emceed by NBC 10 Boston anchor and health reporter Kristy Lee, the event will honor the Moy family, restaurateurs and owners of China Pearl, Shojo, Rukus and BLR by Shojo. Longtime Joslin supporter and “A Taste of Ginger” founder Leverett Wing, whose parents helped to establish the AADI at Joslin, will serve as event chair. 7) The Greeks have been making wine for more than 6000 years – from the age of Dionysus and Homer to the present day. But their wines have remained a mystery to many – until now. Winemakers from all over Greece are coming to Boston for Odyssey, a Greek wine tasting adventure. Expand your palate as you taste wines made from indigenous grapes found only in Greece; sip on international blends; and marvel at rare vintages uncorked just for Odyssey. Take the opportunity to support a great cause and experience the sights, sounds and tastes of Greece. Attendees at the tasting will tour the three main wine producing regions: The Islands, The Peloponnese and Northern Greece each with characteristic terroirs, indigenous grapes and 6000 years of winemaking history; meet the winemakers and learn about their vinification techniques, terroir philosophies and personal stories; and of course, taste indigenous, international and rare varieties and vintages from the Cava Spiliadis portfolio. Odyssey is hosted by George Spiliadis, son of noted Milos restaurateur Costas Spiliadis. The Odyssey event is being held on Friday, March 30, from 5pm-8pm at Post 390, at 406 Stuart St, Boston. I'll be attending this event as I love Greek wines and always want to expand my palate and try more wines from this compelling country. I've previously several wines from the producer that will be at this event and I was impressed with what I tasted. This is going to be a killer wine event and highly recommended. 8) Chef Rick Araujo and his team at Civic Kitchen & Drink welcome Chef William Nemeroff of B.T.’s Smokehouse as the featured guest at Civic’s Guest Chef Collaboration Series. The special event takes place March 21, at 6pm, at Civic Kitchen and Drink. Reservations are highly recommend and can be made by calling 508-3429-5179 or visiting www.civickitchenanddrink.com and click the ‘order online’ button. 9) Matadora, the Spanish tapas restaurant located at the newly-renovated Hilton Boston/Woburn, will open for brunch on Easter Sunday, April 1, from 11am-2:30pm, offering a buffet brunch with a dash of Spanish flare. In a number of respects, Vermouth is the Rodney Dangerfield of the wine world, not getting sufficient respect. Many people don't even realize that it's a wine, thinking it's only a minor ingredient in cocktails. That needs to be changed and Vermouth needs to be respected and loved for all that it can offer. As I've said before, "It's a wine with a fascinating history that extends back thousands of years...It can be delicious and complex, intriguing and diverse, and offers a template upon which a producer can put their individual stamp." Vermouth is a fortified and aromatized wine, which works well in cocktails but also can be enjoyed on its own, maybe with a ice cube or two. The intriguing complexity of some Vermouth makes it a compelling wine on its own. Fortunately, there are numerous producers taking Vermouth seriously, creating some unique and fascinating Vermouths, from a wide range of base wines and botanicals. Gonzalez Byass, which was founded in 1835, is a Sherry producer, one I visited back in 2010, and they export a wide range of delicious Sherries. Back in the 19th century, they also made Red Vermouth, and two years ago they started to produce it once again, using the original recipe as their foundation. I received a media sample of this new product, the Gonzalez Byass La Copa Vermouth, and it is impressive and complex, delicious and versatile. This is a Vermouth for Sherry lovers, wine lovers and cocktail lovers, earning my highest recommendation. The specific recipe for their Vermouth is considered proprietary, so they won't provide it, except that is not fully the case. Each year, the González Byass Foundation celebrates International Archives Day, which is held annually on June 9, by opening up their Historical Archives to the public. On this day, they have previously displayed the original recipe for their Vermouth, from 1896, and might do so again at future International Archives Days. They also have provided some basic information about the formula, enough to be intriguing. The La Copa Vermouth is a blend of 75% Oloroso Sherry and 25% Pedro Ximinez Sherry, both from soleras that are approximately eight years old. It is rare to find any Vermouth made from Sherry, and we certainly need more such Vermouths. Some of the botanicals that are blended into the Vermouth include wormwood, angelica, savory, clove, orange peel, nutmeg, quinine, and cinnamon. The name, "La Copa," derives from the name of the branding iron used on the cattle and horses of the ranch of Marqués de Torresoto, the son of the bodegas’s founder Manuel Maria González. The label for the La Copa is also based on the original 19th century label for their Vermouth. Relaunched in June 2016, La Copa Vermouth ($25) is a taste of history but one which also presents well in the present. On the nose, its complexity is first experienced, a wonderful melange of spices, salted nuts, and citrus notes. It's an alluring nose, one that will entice you to drink, to hopefully realize the vast promises of those aromas. On the palate, you're not disappointed in the least, intrigued by its complexity, balance and elegance. There is a superb blend of spices and herbs, with nuts, caramel, a touch of plum, candied orange and more. The Sherry influence is prominent and well integrated. There is balanced sweetness with hints of bitterness, exactly what you want from a fine vermouth. It's smooth with a lengthy, satisfying finish and is wonderful on its own, though it also does great in a Manhattan. It is the use of the Sherry which elevates the quality of this Spanish Vermouth and I would love to see other Vermouths using Sherry as the base. Gonzalez Byass is producing a compelling wine, and I strongly recommend that all wine lovers sample this intriguing Vermouth. Consume it on its own, reveling in its complexity, or use it in your favorite cocktail. Eat More Seafood! Eat More Seafood! Eat More Seafood! Yes, I've said this repeatedly before, in multiple posts over the years. And it continues to bear repeating as many Americans still haven't stepped up as much as needed. Seafood consumption will significantly lessen your chances of dying from the leading cause of death in the U.S. That's a powerful reason why you should consume more seafood and it's far from the only reason. 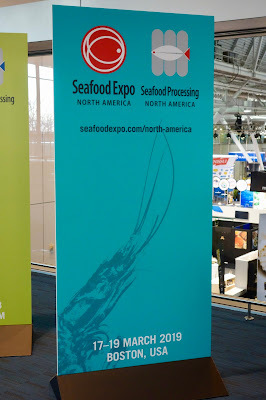 The Seafood Expo North America is in full swing, having started yesterday and it will end tomorrow. Once again, I'm walking its myriad aisles, exploring the various booths, tasting samples of seafood, learning about seafood issues, and much more. For a writer, the Seafood Expo is such a fertile ground for story ideas. I'll be writing about my experiences at the Expo in the near future but wanted to begin my coverage with the most important issue, trying to convince more Americans to eat more seafood. In the Boston area, we are fortunate that we have seen a recent surge of new seafood restaurants, which can help us reach our annual goal of 26 pounds of seafood. 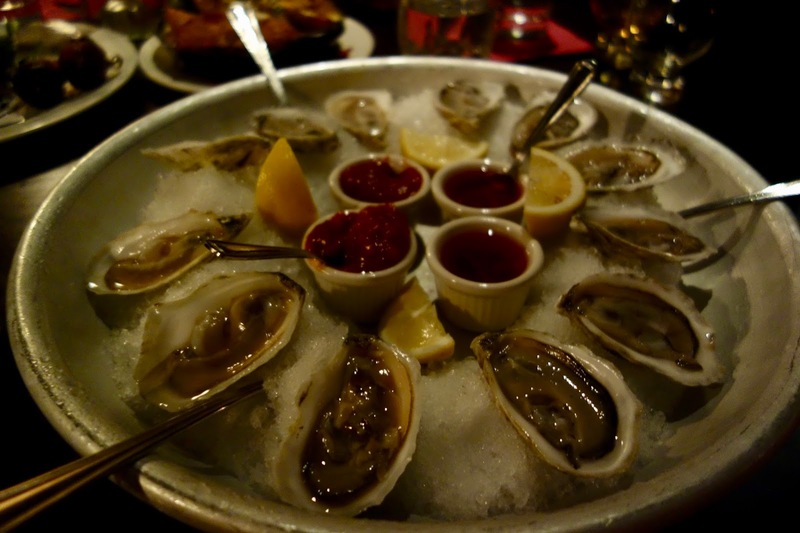 Consider places such as Island Creek Oyster Bar (with a second location in Burlington), Row 34, Select Oyster Bar, Il Molo, Saltie Girl, Luke's Lobster, Tonno (with a location coming to Wakefield), and Haley.Henry. There are numerous other seafood restaurants which have been around for longer too. You can also go to the retail location of Red's Best at the Boston Public Market to purchase seafood meals or fresh fish which you can prepare at home. Step up your game and eat more seafood. Try to consume seafood at least twice a week. Seafood is delicious, can be prepared in a myriad of ways, and is extremely healthy. So what's stopping you from reaching your seafood consumption goal? I'll soon pull together all of my various seafood posts, providing responses to the common reasons people don't eat enough seafood. Let's make 2018 a year to remember for seafood consumption. 1) Chefs Ken Oringer and Jamie Bissonnette announce the debut of JK Food Group Crawl, a tapas tour of their Boston restaurants Toro, Coppa and Little Donkey designed to enjoy throughout one evening. For groups of 4-6, the experience includes a selection of small plates, drinks, tax and transportation between restaurants (gratuity not included), available on Sunday – Thursday. At Toro, their Barcelona-inspired tapas bar, guests can begin with a creative take on both modern and traditional tapas using market fresh ingredients, kicking off the evening with a festive porron of Cava or glass of Sangria alongside favorites like the Datiles con Jamon, Pan con Tomate, Pimentos del Padron and more. From there, it’s off to Coppa, their Italian enoteca located at a cozy corner of the South End, where a selection of house specialties can be paired alongside a glass of wine, such as Wood-oven Roasted Meatballs, Cavatelli con Pollo or the savory Salsiccia Pizza. For a sweet finish, crawlers will end at Little Donkey, Oringer and Bissonnette’s global small plates restaurant in Cambridge’s Central Square, with a menu inspired by their world travels. Tuck into the beloved Chocolate Chip Cookie Dough with milk espuma, playfully served on the beater, Ice Cream Churro Sandwich and more, alongside a drink of choice, from dessert wine to Little Donkey’s signature rotating drink: The One in the Grapefruit. Guests can also opt for a savory third course, with bites like Duck Nachos and BLT Lettuce Wraps. Starting March 4, reservations will be accepted through www.jkfoodgroup.com. Pricing options include $165 per person for drinks + two food courses plus dessert; or $175 per person for drinks + three full food courses. Credit card(s) are required to hold all reservations. Groups can cancel up to a week in advance with no charge. Cancellations within a week of the reservation will be charged $50 per person. 2) CHOPPS American Bar and Grill and Executive Chef Stefano Zimei invite guests to indulge in some of the West Coast’s best vineyard offerings with a special California Wine Dinner on Friday, March 16, at 6:30pm, featuring wines from Domaine Chandon, Duckhorn, Silver Oak Winery, Faust, and Foley Vineyards. Seats are available now for $95 per person (inclusive of tax & gratuity). Space is limited and reservations are required. Call 781-221-6643 directly to book seats. A credit card is needed to secure a reservation. 3) Thirteen million children across the country struggle with hunger, putting us at risk of losing an entire generation of leaders, innovators, and problem-solvers. For more than 20 years, Chef/Owner Andy Husbands has worked closely with No Kid Hungry, the national campaign run by Share our Strength, to end childhood hunger through his Cooking Matters Dinner and a variety of other events. On Monday, March 12th, starting at 6pm, Andy Husbands and the team at Tremont 647 will host the 21st Cooking Matters Dinner to benefit No Kid Hungry with a cocktail reception at 6:00PM followed by a multi-course dinner with wine pairings served family style at 7:00PM and prepared by some of Boston’s most renowned chefs, including Tony Maws, Chris Coombs, Jeremy Sewell, Jason Santos, Tim Maslow and Joanne Chang. 100% of proceeds from ticket sales will benefit No Kid Hungry’s work to end childhood hunger in Massachusetts. For tickets, please visit www.events.nokidhungry.org/events/tremont-647-cooking-matters-dinner. 4) Assaggio restaurant invites guests for a Fantasy Fine Wine Dinner in Boston's historic North End. On Wednesday, March 7, from 7pm-11pm, the newest restaurant to join Depasquale Ventures, Assaggio will be hosting a Fine Wine Dinner highlighting fantasy fine wines and a five course serving of their Positano cuisine from Italy's Amalfi Coast. Reservations are $65 per person and can be made by phone at (617).227.7380. Reservations are $65 per person and can be made by phone at (617).227.7380. 5) On Thursday, March 15, from 5pm-10pm, Viale, in Cambridge, will host a Roots, Rum & Reggae party, celebrating with a Caribbean inspired menu, Tropical Cocktails, and Island Music. They are partnering with Privateer Rum, who will provide all the rum for the cocktails. The music will be provided by Murf Reeves Music. To make reservations, or for more information, please call Viale at 617-576-1900. 6) It’s traditional to celebrate special events with roses, so Chef Michael Serpa of Select Oyster Bar in Boston's Back Bay has decided to celebrate the restaurant’s third anniversary not with flowers—but rosé wines. Join Serpa and cooking colleagues from Myers + Chang, SRV, haley.henry, and pop up sensation, East Boston Oysters, for an evening of rosé and rosé friendly dishes at Select Oyster Bar on Tuesday, April 3rd, at 6:00 p.m., to celebrate Select Oyster Bar's third anniversary. Tickets start at $100 per person and seating is limited. A portion of the proceeds will benefit No Kid Hungry through Chefs Cycle bike-a-thons this May in Santa Rosa, CA and in September in Charlottesville, VA, where Chef Serpa and other notable Boston-area chefs will be participating. Visit SelectOyster.com for reservations and more details. Rant: Too Many Italian Restaurants in Wakefield? A new Italian restaurant is coming to Wakefield, but does the town really need it? Back in 2011, I wrote a post on food trends, and stated: "Let me use another example, the suburban town of Wakefield. It has a population of about 25,000 and already had several Italian restaurants. Yet within the last year or so, even more Italian restaurants opened, most within about a half-mile or so. How many similar Italian restaurants does one small suburban town need? Why would a restaurateur decide to open another Italian place, when there is already plenty of competition? It doesn't seem to make good business sense." Since that time, a couple Italian restaurants have closed but others have opened, so there are still plenty of Italian restaurants in Wakefield, many located within a short distance of each other. As a general thought, I'd probably echo the idea from my prior post and state Wakefield doesn't need another Italian restaurant. I'd rather see a new restaurant serving a different type of cuisine. However, based on recent news, it appears I need to modify my position. I'm actually excited to learn about a new Italian restaurant, Tonno, which may open in Wakefield this summer. What has gotten me to change my mind? If you check out the menus of the existing Italian restaurants in Wakefield, you'll find many similarities. Plenty of Chicken Parmigiana, Eggplant Rollatini, and Veal Marsala. In general, their differences appear minor and it is that relative similarity which is off-putting. Wakefield certainly doesn't need another Italian restaurant with a similar menu. Fortunately, Tonno is bringing something more unique to Wakefield. Back in 2000, Chef/owner Anthony Caturano opened Prezza in the North End and it is one of my favorite Italian restaurants in Boston. In 2016, Chef Caturano opened his second restaurant, Tonno, in Gloucester, highlighting Italian seafood dishes. With a hope of opening this summer, Chef Caturano is establishing a second location of Tonno in Wakefield. The menu at the Wakefield location will be similar to that of Gloucester so check out their Menu. You'll note the concentration on seafood dishes, which is something you won't find in the other Italian restaurants in Wakefield, all which generally have only a few seafood dishes. At Tonno, you'll be able to get Oysters and Cherrystones, Crudo and Tuna Tartare, Octopus "la plancha" and Grilled Shrimp, and so much more. Some of the entrees include their famous Grilled Tuna Steak, Cioppino, Cod Oreganatta, and Scallops "la plancha." You'll also find homemade pasta dishes, from Tagliatelle Bolognese to Cavatelli, Rabe & Sausage. If you compare Tonno's menu to the other Italian restaurants in Wakefield, the amount of similarity is very small. Chef Caturano is bringing a much different Italian restaurant to Wakefield, one which fills a gap, especially considering all of the seafood dishes they offer. As I'm sure you're aware, I've long been imploring my readers to eat more seafood, especially because of all its health benefits. To have a new restaurant, promoting fresh, and often local, seafood, then that is a restaurant which appeals to me. I also have much faith in the culinary skills and knowledge of Chef Caturano, and feel secure that his new restaurant will be impressive. I rarely dine at the other Italian restaurants in Wakefield, finding most of them to be of rather average quality. However, I expect I'll be a regular at Tonno when it opens. So, before you dismiss Tonno as just another Italian restaurant, do your research and understand its differences, and the reasons why you should anticipate its opening.